Explore Japan’s enticing Yamanashi area on this private 10-hour tour from Tokyo with an English or Chinese speaking support staff. There are 2 types of cars available including a mini-van (for max 11. persons) or micro-bus (for max. 20 persons). Both have heating and air conditioning systems, but are not equipped with Wi-Fi. Visit famous locations like Mt. Fuji 5th Station and Lake Kawaguchi. Before returning to Tokyo, stop at the largest shopping mall in Shizuoka, Gotemba Premium Outlets. Begin your day with pick-up at your Tokyo hotel between 8:00 a.m. and 09:00 a.m. The tour will first head to Mt. Fuji 5th station, where the car will drive up to 2300 meters above the sea level by Subaru Line. (*Please note that when the road to the Mt.Fuji 5th station is closed due to weather or other conditions, you will visit Fujisan World Heritage Center instead.) You will be amazed by the breathtaking panoramic views from the observatory. Not only you will see the grand view of the foot of the mountain, but you will also be able to enjoy the majestic view of Mt Fuji. Spare a moment to appreciate the beauty as you take a 40~70-minute walk around the area. Next, you will head to Lake Kawaguchi. Here you will be able to view the World Heritage Mt. Fuji and taste local food, like the Yamanashi specialty Hoto hotpot or other meals you like. Lunch is not included, so please have it independently. The average price for lunch in the area is about 1,080 yen per person. 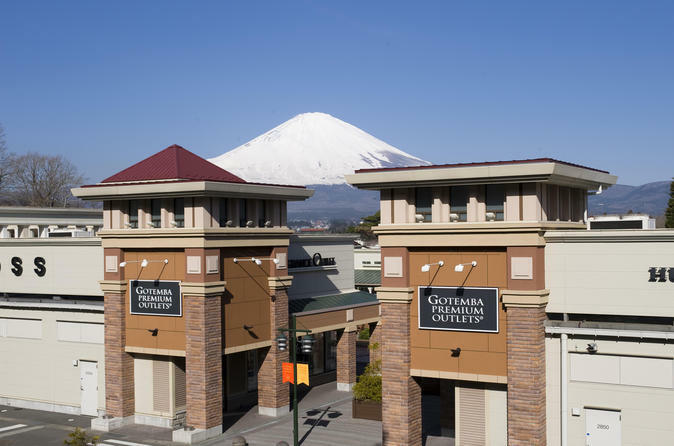 After lunch, make a pit-stop at one of the largest shopping malls in Japan "Gotemba Premium Outlet" for 1.5-2 hours to shop for souvenirs. After a full day, you will be driven back to your Tokyo hotel between 6:00 p.m. and 8:00 p.m. depending on your chosen pickup time.